Hello, it’s been ages! How have you been? Oh good/Oh dear [delete as applicable] I’m glad/sorry [ditto] to hear that. What I loved the most was the subtle humour and satirical look at society. It really is a spectacular read and surprising in parts. Parts of the novel push at boundaries that really should be nudged more often… Love it. Love it. Love it. It deserves a reread! We’re justifiably proud of the range of covers we produce at Angry Robot, and often like to shout about them from the rooftops. Sometimes, though, we just like to sit back and let the artwork speak for itself. Just look at that detail. Click the image for a larger version*. Are you getting bored of this yet? We’re definitely not. It seems like pretty much every day in the Angry Robot office is a “woah, that’s just awesome!” day at the moment, and as long as the weather remains cold and wintery long may that little flash of sheer joy continue to light up our chilly world. Today it’s the cover for Ian Whates‘ first fantasy novel, City of Dreams & Nightmare. The cover is by Greg Bridges, the Australian artist who also graced us with the cover for Kaaron’s Walking the Tree. OK, so there’s been a “healthy debate” recently about the featuring (or the avoidance of featuring) characters from non-white cultures on fantasy and SF books. For us, well, perhaps we’re being a tad naive but it never occurred to us. Zinzi, the “girl who finds things” in Lauren Beukes’ very urban fantasy Zoo City, is a black South African, so of course that’s what she looks like on John Picacio’s cover. The huge swathe of internet love for John Picacio’s cover for Lauren Beukes’ Zoo City continues, unabated, and we’ve even had Lauren and Marco our Robot Master contacted by the South African media for an interview about it! Meanwhile, over at John’s website, he relates the experience of working on the cover. Oh, it seems to be cover week this week! Thomas John The author will be one of the guests at the SFX Weekender 5-6 February. Why not pick up a copy of the book and get him to sign it while you’re there! Back in December we showed you the absolutely gorgeous cover art for Maurice Broaddus’ forthcoming novel, King Maker. Stunning wraparound art from the uber-talented Steve Stone (click the thumbnail for a bigger version). Here’s the cover with all the covery bits ‘n’ pieces added on by the talented designers at ARGH! Clicking on the image opens a bigger version. * You owe me a beer for that, Guy. It’s no use, we just can’t keep this to ourselves a moment longer. Here’s the cover art for King Maker, book one of Maurice Broaddus‘ extraordinary Knights of Breton Court trilogy. These books, if you recall, are a retelling of the King Arthur myths, set amongst the inner city gangs of Indianapolis. It’s dark, vicious and totally of the moment: like The Wire meets Excalibur. Because when Angry Robot does urban fantasy, we never forget the “urban” part. One of our most popular covers to date (and we’ve had a lot of popular covers in our short time on this earth) was Vincent Chong‘s wonderfully-realised cover for Nekropolis (Tim Waggoner). Vinnie’s just published a guest blog over at Pat’s Fantasy Hotlist in which he discusses the process of creating cover art from commission to conclusion, using Nekropolis as his example. We like to have a laugh and a joke on here sometimes, because, well let’s face it: we’re funny guys. Also devilishly handsome and great in the sack (and not at all slightly overweight, just slightly undertall). Back in April we brought you Vincent Chong‘s cover for Tim Waggoner‘s zombie P.I. novel Nekropolis. 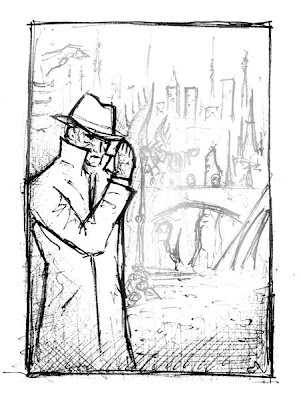 We’ve just had the art through for the second book in the series, Dead Streets.